Below, in the same order, pictures of all cars except the T55 replica. This replica was probably of Argentinian origin. After some complaints that the Bugatti history is not visible at all in Molsheim (that is, for the enthusiast whi visits the first time), now something will be done to improve that. 10 Totems will be installed near the interesting sites in the Molsheim Area, with informative text in French, English and German. The Totems were presented on the occasion of the Molsheim Festival, on September 14. October 31, 2006 Beware to have your extinguisher nearby! Always keep a fully charged fire extinguisher handy when you start your car up after a period of rest. 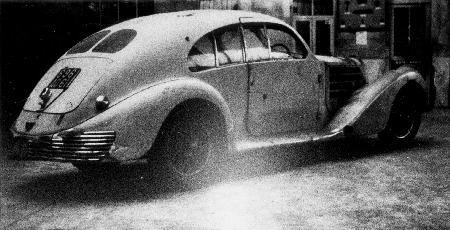 This is Bugatti 57287 (or was) ; a two owner car from new, the elderly owner flooded the car as he attempted to start it, the gas pooling onto the carpet under the engine. Trying again, this time with a can of starter fluid, the car back fired, setting the gas on fire. He did have a fire extinguisher, but was unable to get it to work...he was going to pull the Bugatti out of the garage, but his regular car was blocking the door and the keys were in the house...by the time he returned, it was fully engulfed in flames. 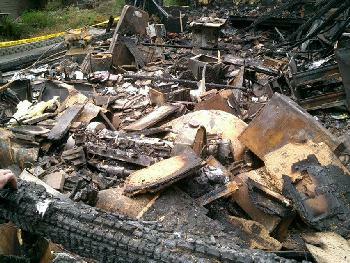 Not only do you have to protect your car from damage by fire, you also need to protect it on the road from accidents. Many accidents occur due to DUI, or driving under the influence. Criminal defense lawyers like those at columbusduilawyer.net deal with DUI cases and property damage due to DUI accidents. September 11, 2006 The third edition of the Bugatti CD ROM is now ready! 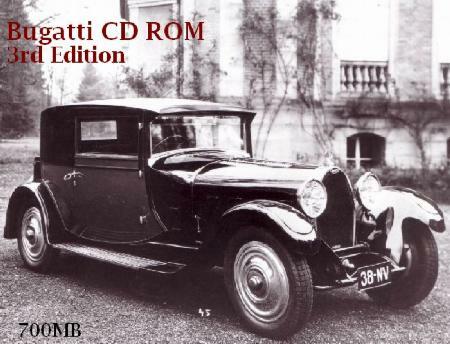 The third edition of the Bugatti CD ROM is now ready! (over 700MB). Those who have seen the edition 2 CD Rom, know that there are a load of photographs on the CD, which are not on the site! 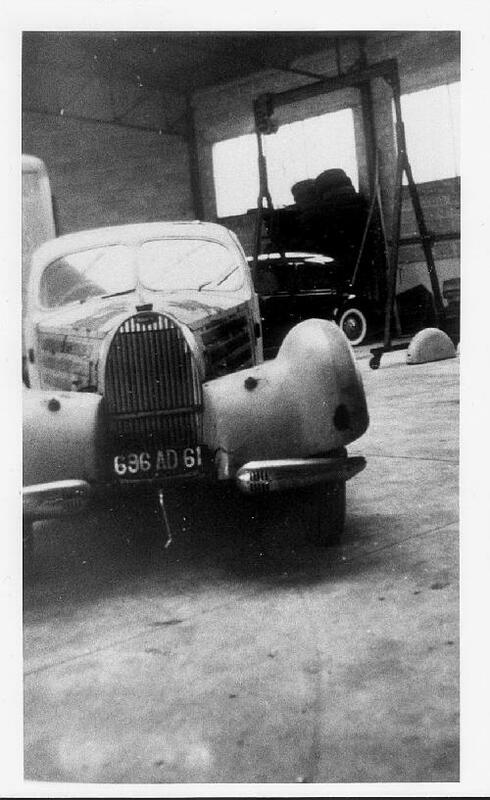 For edition 3, I included over 3000 additional pictures of Bugattis. These are not the same as in the 2nd edition. Apart from this, the CD Rom includes all the past issues of the Bugatti Revue (91 articles in 11 volumes! 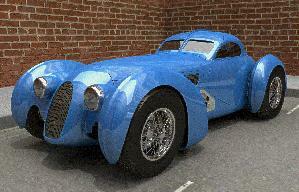 ), as well as the complete contents of the Bugatti Page, including all the pictures, etc. etc. In total there are now over 8000 pictures on the CD Rom! Difference with using the Internet is also that pages can be read far more quickly, no need to wait for the pictures to download first. If you are interested, the price is still the same at $30 or 25 Euro. Add $5 for packing and postage (outside Europe), or 3 Euro P&P for Europe. This is payable cash by mail or by PayPal, my PayPal name is J.J.Horst@BugattiPage.com. But, PayPal Payers Pay more ($36 or 29 Euro) because of costs involved. When sending by mail, please send to the address below. August 30, 2006 New Discovery! 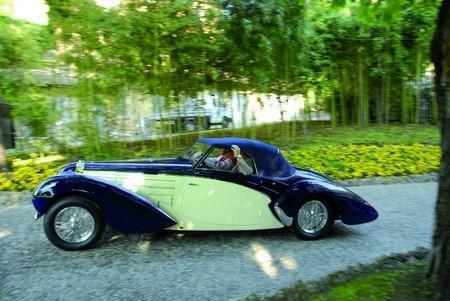 A very rare Bugatti coupe by O-Uhlik of Prague has surfaced 200 Kilometers from Prague in the Czech Republic. 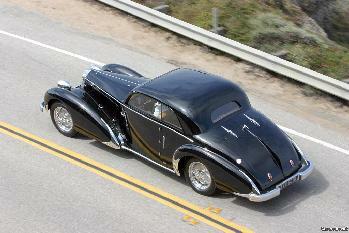 The streamliner aero-coupe was fitted with a supercharged engine and ran for years in the former Czechoslovakia. Made of steel with a wooden frame the body is in good condition missing a few parts, but without much rust or modification. It still has it's original makers badge and some of the interior still in place. 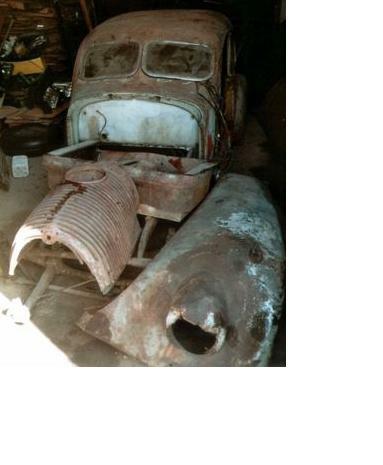 The owner, Madame Carolina from a royal blood line of Prague tells us that the Bugatti chassis had been discarded, the motor mis-placed, but photos exist proving it is a real Bugatti . Madame Carolina wishes that some Bugattist seek the restoration of this important piece of Prague's history. 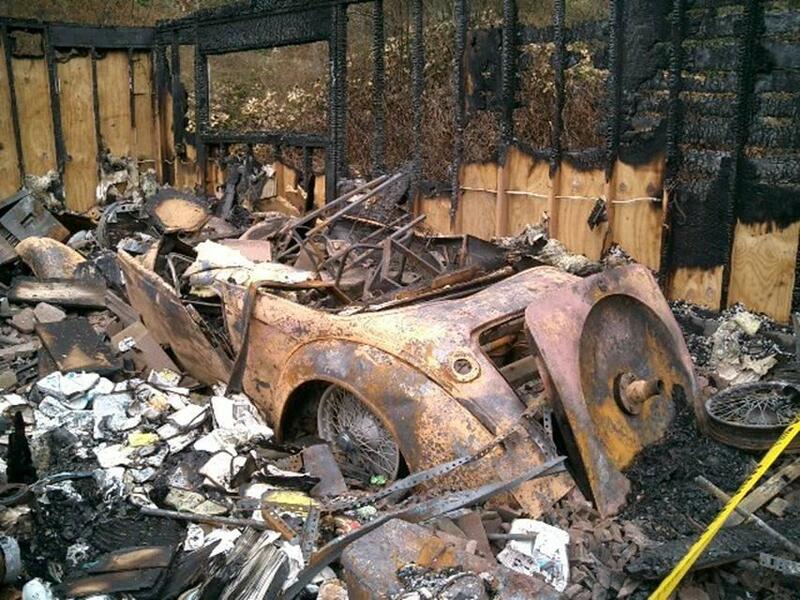 She expressed an interest to possibly sell it to a Bugattist qualified to make this Bugatti road worthy again. More to come in the upcoming news. At the 20th Century Decorative Art and Design auction, London, King Street. If you know some people coming with their Bugatti this summer to Molsheim, please let it know : we are looking to make an official welcome for them! 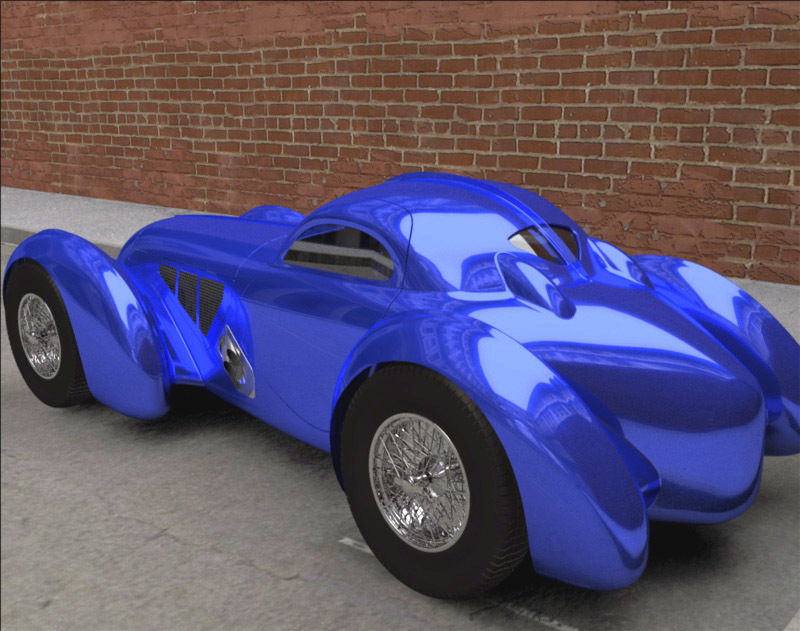 The Municipality wants to develop the contacts with all the people who are connected to Bugatti and specially the Bugattistes . Various projects depending on the number and the timing of the visit are studied . Just contact the" Mayor of Molsheim" , or "A l'attention de Monsieur le Maire de Molsheim" - Place de l'Hôtel de Ville - F-67120 MOLSHEIM to tell when this visit will happen. The next edition will take place June the 24, and 25 2006 on the circuit of Dijon-Prenois. The test should attract 400 candidates, and a total of 2000 cars of collection will be exposed during the two days of the event. The edition 2006 reserves an innovation: the public will be able to reach the line of the stands during the pause of the semi-day, in order to admire the racing cars which will be aligned there. The list of the registered voters is not published yet, but the organizers await Formula 1 having written the History (Matra, Tyrell, McLaren...), of the protos (Ford GT40, Lola T70, Matra 650...), but also of the cars of legend like Ferrari 250 and 275, Aston Martin DB4, AC Cobra, Chevrolet Corvette... Lastly, the Club Bugatti France will go to Dijon in large committee, with step less than one about thirty models of Grand Prix, Type 51, 35 and 37! A great moment in prospect. 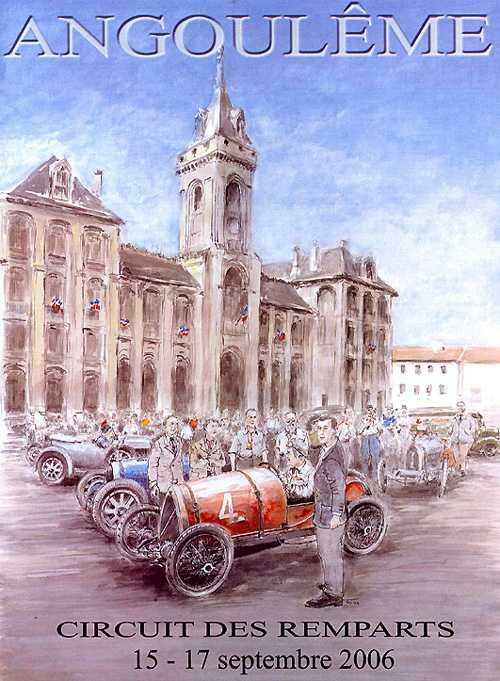 The French Bugatti owners club is invited to celebrate the 100th birthday of the Grand Prix in France (1906-2006) during the next Formula one Grand Prix the 14-15-16th of july. For more info: see this Word.doc file or E-mail Helge Hauk: dr.hauk@chello.ator contact the BUGATTI CLUB AUSTRIA, Kirschenallee 11, A 3430 TULLN. 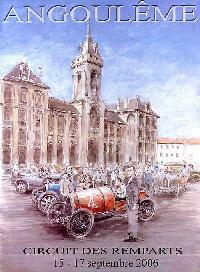 Festival BUGATTI as always organized by EBA members (Enthousiastes Bugatti Alsace). The 125th of "the Patron" will be celebrated. The car has not been in Molsheim for 43 years, and will be a running part of the rally! Once again, the Bugatti mark will be very well represented like each year. The poster of this year is signed François Chevalier, normal for a person as him which is "Bugattiste" since the ten eight years age. As always, Bugattis were well represented at Pebble Beach in this years event (the weekend of August 19-20). 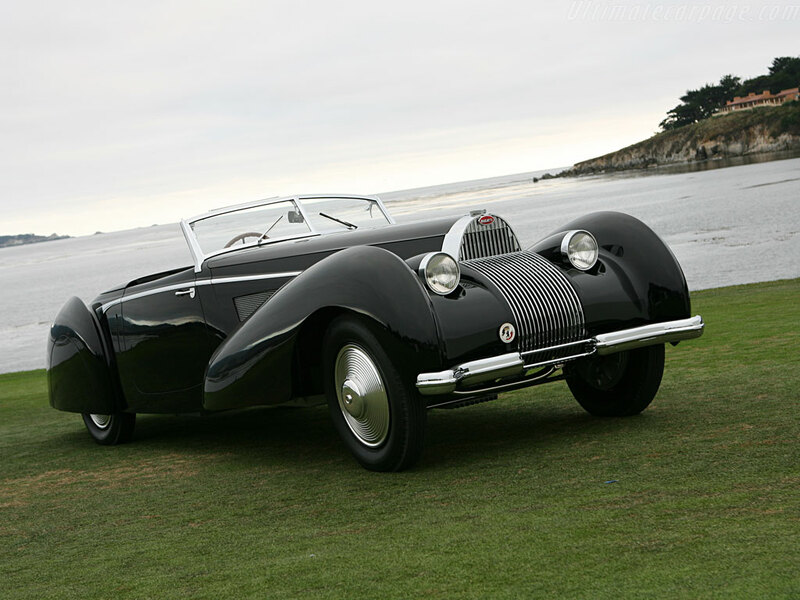 Most spectacular Bugatti was the Bugatti Type 57 C Voll & Ruhrbeck Cabriolet. Apart from this I show here pictures of the Type 57 Paul Nee Pillarless Coupe, and the Bugatti Type 43A Millon-Guiet Torpedo. 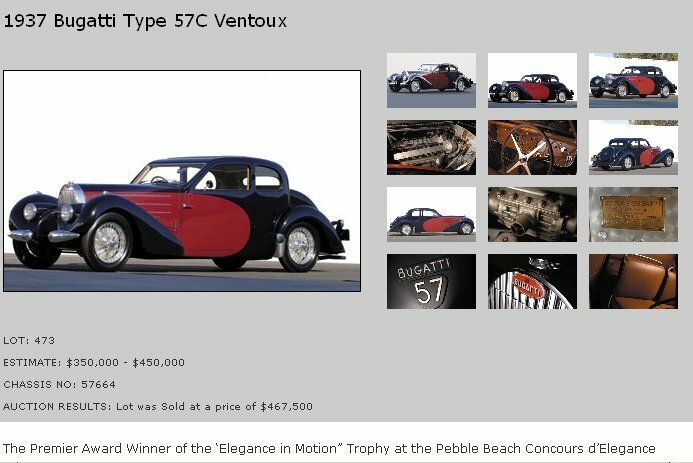 Of course there were a lot of cars on the multitude of auctions surrounding Pebble Beach, more about these auctions (and results) soon. 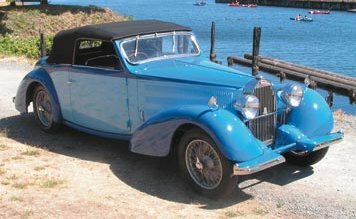 And: overall winner (Best of show) was a 1931 Daimler Double-Six 50 Corsica Drophead Coupe, owned by Robert M. Lee of Reno, Nev. 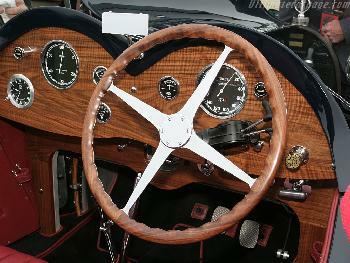 There's a lot of discussion, especially on some of the Forum's like the French ones, about Replica Bugattis, or partly new ones using old parts or entriely new ones without any original parts (see the parts for sale page for some offers!). However, this is something entirely different, it doesn't pretend in any way to be original, it's clear from the beginning that it's not. And in that, It's one more of all the different cars we have seen, that are inspired by Bugatti (either in general or very specific by one particular car, the Shah of Iran car). 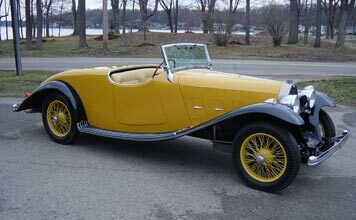 We reached out to Gary Fulkerson at DIGITAL SERVICES in White Lake, MI www.godigitalservices.com to magically transform photos of the first Foose Boattail in primer to see what a Bugatti-esque fully enclosed pontoon, Figoni Falashi flavored Foose Speedster could look like (five images above). Gary, who is a graduate of the College for Creative Studies in Detroit for Automotive and Product Design, not only gave us what we asked for, but tossed in a few variations of his own to further stimulate us. These images are presented here for your enjoyment. Which one will we build? How about full chrome skirts on one side and chrome eyebrows on the fenders on the opposite side? We can't decide which looks best, so we'll do both. After all, you can only see one side at a time, right? Gary Brown of BROWN's METAL MODS in Indianapolis will be charged with the responsibility of building the car. It already has a BMW V-12 engine and automatic transmission, and we're thinking of six Webers for induction. There is a questions if the transmission will occupy too much room making footwells too small, so there might be an alternative powerplant. When will it be done? Not soon enough. Stay tuned for the further adventures and updated construction photos. Below, one more drawing and the car that is being built, besides the car that inspired it. No updates for almost a month, due to holidays and a computer crash (nothing lost, everything works again!). Due to this, I also was unable to read my mail for the same time, leading to a full mailbox. Please resend any mails if you received a message that your's "bounced back". This September will be a busy time, with the Paleis het Loo Concours, the festival in Molsheim, and the BCN rally, all in September! June 29, 2006 Fully restored T73C presented. This T73C, unknown to me until now, was presented at the 2006 Greenwich Concours. click here for an entire page with photo's and info on chassis 73002 or 73C2. This wonderfully new T73C monoposto with wings was presented at the 2006 Greenwich Concours, It is not a replica, It is the car once known as 73002 or 73C002, your choice. 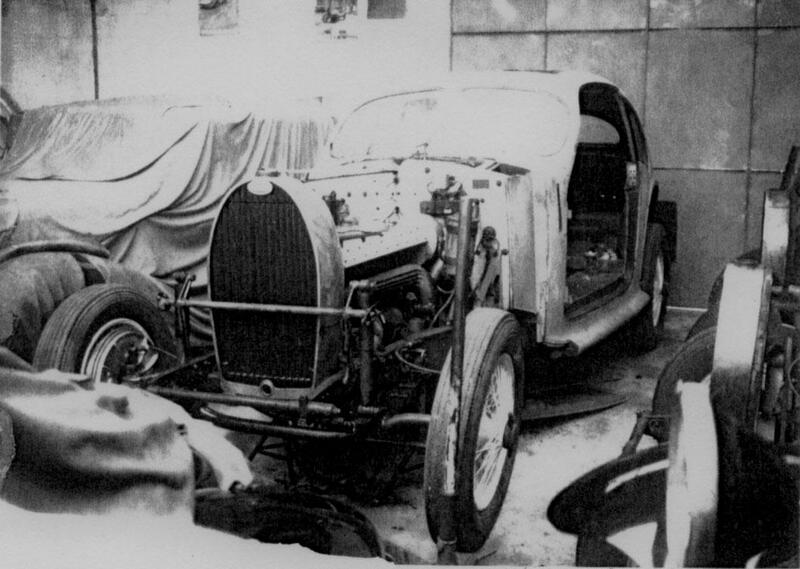 The cars were never finished by the factory so no official chassis numbers were ever assigned to them. Personally I think the car, as a monoposto is OK, but it should have been without the wings (who fits wings to a monoposto?) which are too bulky. 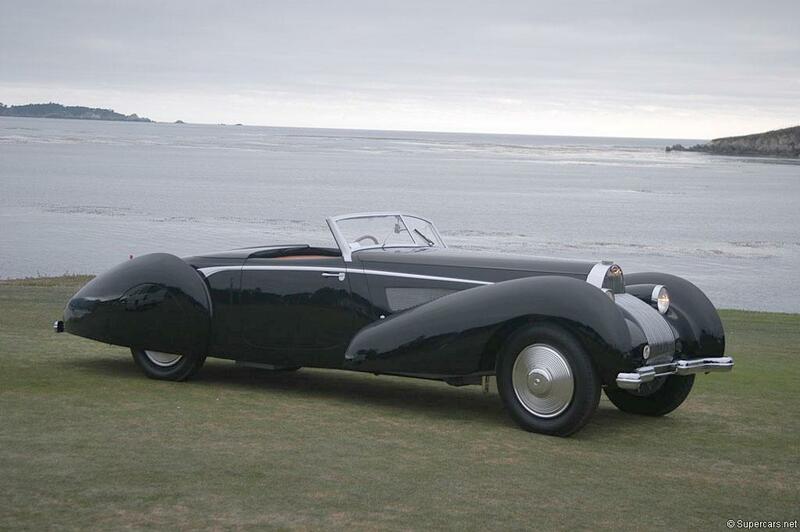 The T59 piano-wire wheels look Ok on the car, but were not originally on it. The positive side: The engine looks highly impressive!! If you want to comment on this car, please do so through my regular mail address. June 23, 2006 Pre - Prototype for the T64 finally restored, original chassis number needed. 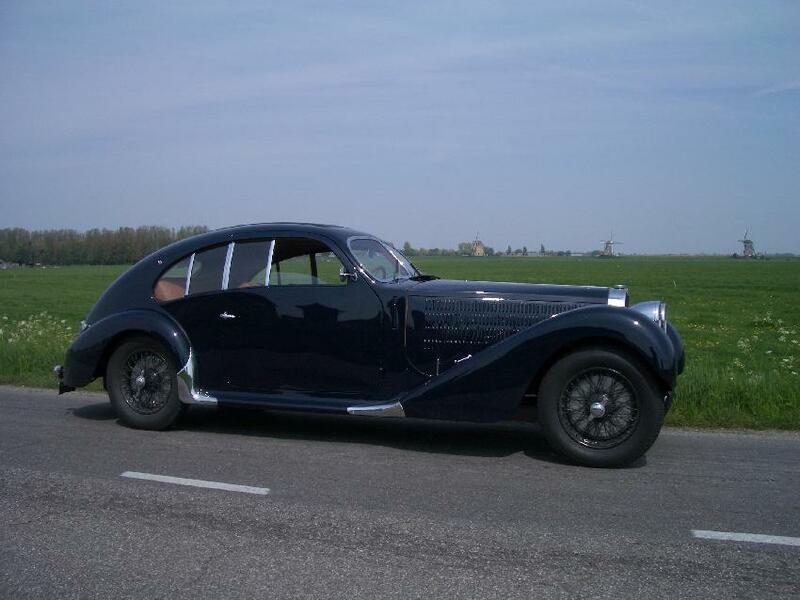 This magnificent car, with a very surprising body, was recently completed by the Dutch (see background) owner. 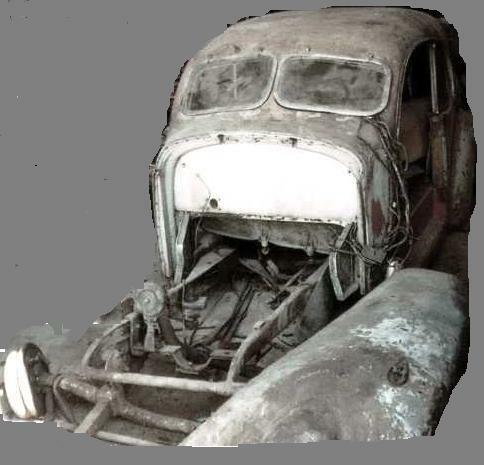 No info on the original chassis number of the body is known, and therefore there is not a good source to date this body. In the Dutch Bugatti register it's indicated that the original chassis number was 57376. 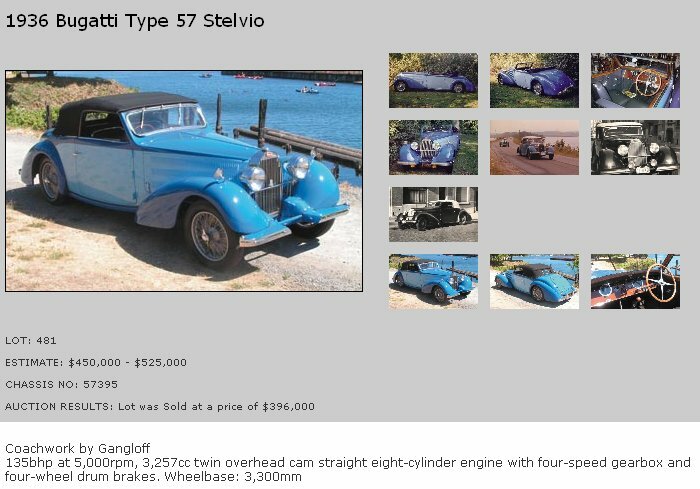 This can not be correct, as that car was a Galibier, delivered in 1936. 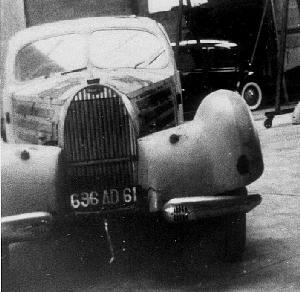 This car (see the old photo's (click for an enlargement) ) has telescopic shock absorbers, and hydraulic brakes, which were available from end 1938, beginning 1939 only. Also visible is the modern exhaust manifold. It was impossible to trace the chassis number through the French registration (696 AD 61). Can anybody be of assistance? Drawing number 1089; Coach (Aero-Dynam. ), for T57, date 25-3-1938. Number 1091, Coach, T64, 25-5-38. Nummer 1093, Berline, T64, 14-1-39. This car is obviously a coach (4-seat, 2 door), and may well be design 1089, preceding the design of the T64 coach by only 2 months. The body is now on chassis number 57625, which was a Ventoux. That Ventoux body still exists, but is in very bad condition. This car is with the current family since 1964, and in the Netherlands since 1960. The current owner (who also asks the question) his father bought this body 30 years ago. Do you have any info (also on design number 1089), please email: prototypet64@gmail.com . 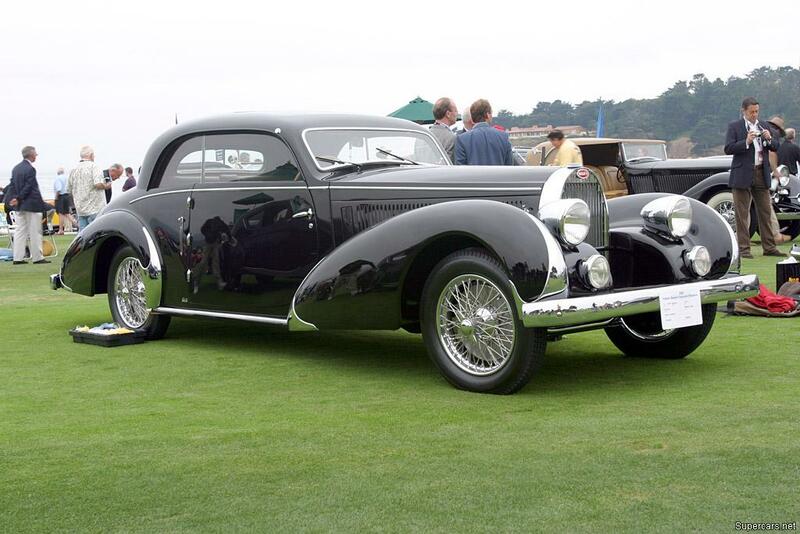 The overall winner, awarded the Coppa d’Oro Villa d’Este - By public referendum at Villa d’Este was the Isotta Fraschini 8 A SS Torpedo Sport Castagna, 1930 , entered by Corrado Lopresto (I). Maybe puzzled by this heading? It's real! The Bugatti T37 driven by B. Ferrari and C. Ferrari arrived fourth in this year's Mille Miglia, held from May 11 to May 14. Below the full (as far as Bugatti's is concerned) results. Now the waiting is for M. Bugatti arriving first in a Ferrari! Pos N. Equipaggio Vettura Naz Anno Cl Pen.Tot. Punti Tot. 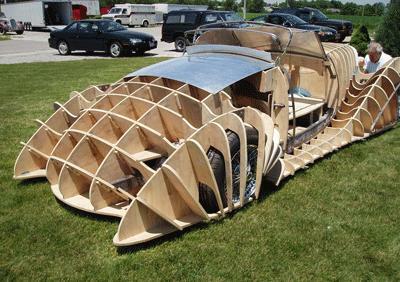 Just when you think you know everything there is possibly to know about Bugatti (which is a lot), a whole new design pops-up, which you never saw before! 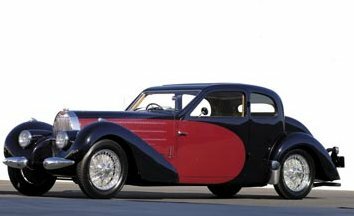 I only knew about one Bugatti motorcycle, the famous supercharged T72 of 12.7cc capacity (yes, the Royale measures 1000 times as much!). 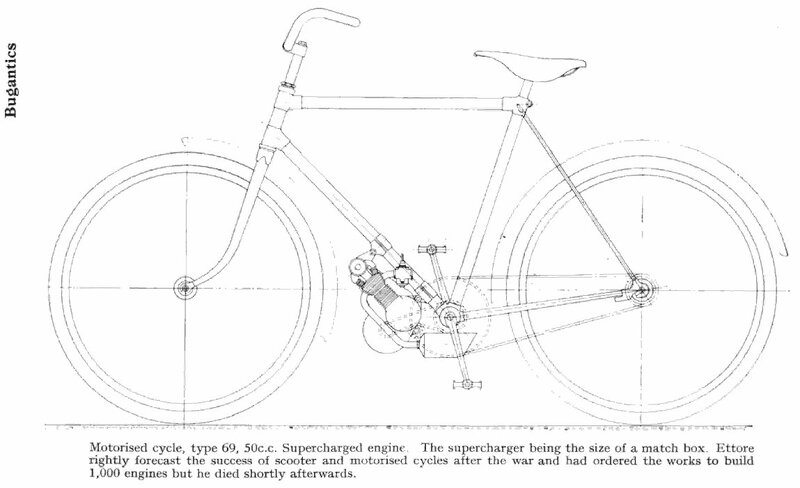 Of course there is also the motorcycle which was used to test the T68 engine in, but this was designed as a test-bed only, not as a motorcycle that was to be sold. However, when going through the type numbers list , there are quite a few still missing! Julio "Pinco" Gonzalez from Argentina sent me this page from one Bugantics issue (winter, 1960 Vol. 23 Nº4), with a drawing of a motorized bicycle wich as you can read is the missing type 69 (Click the drawing for an enlargement). It is quite larger than the more well known T72 (see below), with 50cc. However, still provided with a Supercharger. the design looks much more straighforward than that of the T72, and probably cheaper to produce. After this discovery of the T69, and the T67 just a few months earlier, which will be next? Anybody with drawings of the missing T70 X-16 Aero engine or the T71, please send them to me! 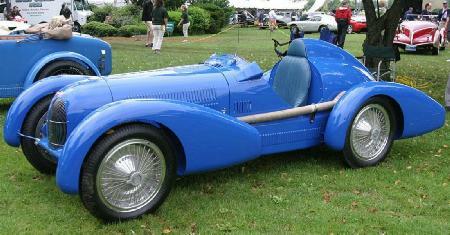 The Bugatti SAS company officially denied any rumours about a small Bugatti of only 50KEuro. Bugatti chief Thomas Bscher now talks about a 4 door saloon, with 950HP, which should cost approximately 1 million euro. No details yet, but this seems to be a logical step. An expensive four-door will be much more useable than a supersportscar, and will therefore sell better. Romano Artioli tried the same with the EB112, which came to late, however. The drawing is an impression by Michiel van den Brink, made for Dutch magazine Autovisie. It is not an official factory release! 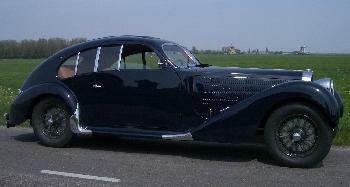 April 25, 2006 Bugatti's next model for only 50.000 Euro! Bugatti for 50 000 Euro - VW-Konzernchef Bernd Pischetsrieder wants to build a low-budget roadster . According to an item in AutoBild We have had these rumours before! Nothing definitive yet! Ed. VW-Daughter Bugatti will design a lightweight sportscar. From 2010 the 4-cilinder Turbo with direct injection (2,0 Liter, 280 HP) could attack the BMW Z4 and Audi TT . A maximum of 6000 per year should be build. The Bugatti T35B # 4914 which won Monaco in 1929 has been sold to the German Collector Fred Loh for a rumoured 2.7 M Euro (1.87 Million British pounds). 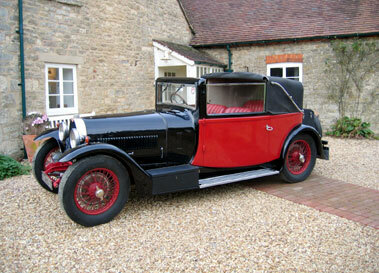 Last September the ex-Grover Williams car was not sold at Bonhams Goodwood Revival auction. (Max. bid GBP 1.8M). 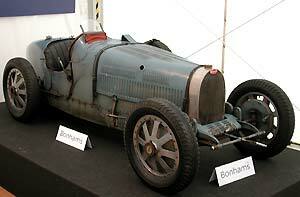 Loh recently acquired another important Bugatti, the ex-Bill Serri T43A, but also bought other cars, like a MB W196 GP. The Tetraboost -lead additive for your engine, has been used by several known Bugatti drivers with positive results. It is now available in the Netherlands and Belgium from Marcel Sontrop. Geneva. To cut waiting times on its Veyron sports car, Bugatti is increasing output at its production facility in Molsheim, France. "We want to take our annual capacity to 70 units, up from the 50 that were originally planned," said Bugatti President Thomas Bscher, in an interview with Automobilwoche at the Geneva Motor Show. "We are hoping that will sharply cut waiting periods, which are now at 14 to 15 months. That's much too long," Bscher said. Sales of the Veyron, which costs 1 million euros plus taxes, or about $1.19 million at current exchange rates, have been running better than expected with more than 70 firm contracts, Bscher said. U.S. customers are especially pressing for the earliest possible delivery schedules. With certification for the United States recently approved, the largest portion of the completed 14 Veyrons will be shipped immediately to the United States. Bscher sees the greatest sales potential for the remainder of production also in North America. Bscher estimates that about 10 percent of Roll-Royce's annual production is sold by the automaker's dealer in Beverly Hills, Calif. Both the greater New York area and southern California "are immensely important for Bugatti," he said. Bscher expects sales of 15 Veyrons a year in Germany. With its 16-cylinder engine and seven-gear, direct-shift transmission, the Veyron is also a complicated vehicle. To help customers and dealers, the company has teamed up with 20 Bentley centers around the world for technical and after-sales service. In extremely urgent cases, Bugatti's "flying doctors" will fly out to a customer to service a Veyron, Bscher said. Separately, Bscher said there is a good chance the brand will get a second model. "Another model could quickly follow the phase-out of the Veyron," Bscher said. "Since we might be finished with the production run more quickly than we at first thought, due to the increase in output, we should make a decision soon," he said. The absolute requirement for any new Bugatti is that it makes money. Moreover, it would have to adapt to the Volkswagen portfolio so that it doesn't compete with Bentley, Bscher said. 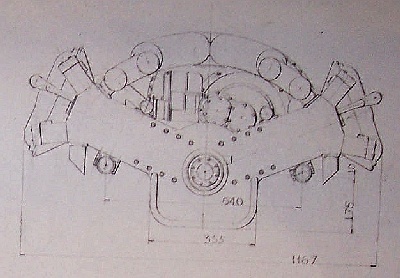 At the current Retromobile, I discovered a drawing of a until now unknown Bugatti engine. 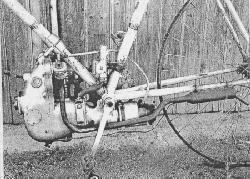 It´s a V16 aero - engine, fitted with a centrifugal compressor. 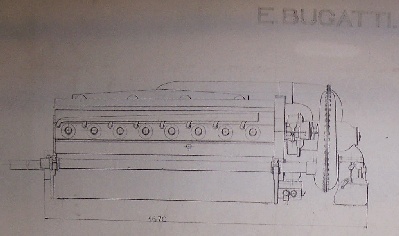 The drawing is a print, not dated or signed, showing the main dimensions. As the block alone (without compressor), is approximately 1m50 long, the engine will have had about 25 litres capacity. In some of the books, a T67 denomination is indicated for a V-type engine of 1939, which is most probably this engine (though some books indicate it as being a V8). Though the engine was not built, this is still an important discovery. 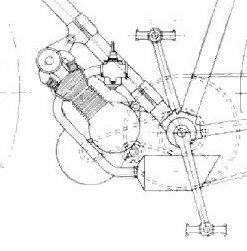 The detail of the drawing indicates that the design was at a state when all major design work had already be completed. It is most probable that this drawing was sent to prospective customers. The lay-out of the engine, with the very wide angle-V of approx. 135 degrees, is not fit for fighter aircraft. Probable use might have been flying-boats, cargo or maybe even bomber airplanes. Several questions remain, for example if deMonge´s team that was working on the Bugatti Airplane had anything to do with the design, or if the engine was designed at the Bugatti Paris office, or maybe even in Molsheim? 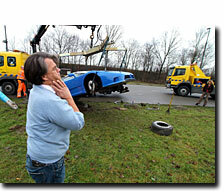 Dutch Guru of Positive thinking Emile Ratelband (on the left photograph), personal coach of several famous people, probably couldn´t think that positive anymore after his EB110 was wrecked by the garageman of the garage, where he had his EB110 being prepared for acceptance in the Netherlands. Mr. Ratelband bought the car in Germany in 1996 while living in Germany, and drove it for approx. 15.000 km´s. He know wanted to import it into the Netherlands. The recent accident of course raised quite some interest by the locals in Arnhem, where the car was crashed near the "Gelredome" stadium. The driver said not to have driven too fast (seems difficult to me in an EB110). The car was seriously damaged when it´s off-road trip ended against a lamp-post. The final car will not be using a Bugatti engine, and will be smaller than the original design was intended to be. The quality of the design is huge, see the pictures, and I look forward to seeing this design being realised! January 23, 2006 Rumours about Baby Bugatti grow bigger! One of many reports I receive on a new, smaller and cheaper Bugatti. Rembrandt is mentioned as a possible name. Congratulations are in order, because there's a baby Bugatti on the way! The model doesn't have a name yet, but the famous horseshoe grille is set to feature on a new 'cut-price' supercar. The distinctive emblem already adorns the world's fastest production model, the 252mph Veyron. However, it has an £830,000 price tag, while the new machine is expected to sell for £90,000. Sources say it'll be named after a 17th century painter - so Vermeer, Caravaggio and Rembrandt are all possible. However, fans who are hoping for a junior version of the 16-cylinder Veyron monster look set to be disappointed. Unlike the 987bhp two-seater, the baby model is set to follow more traditional lines. The entry-level Bugatti is expected to be a front-engined 2+2 using either a VW VR6 or V8 motor. 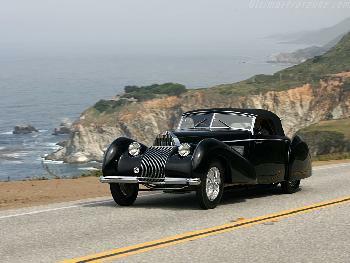 And, as with the Veyron, it could boast all-wheel drive. It'll go head-to-head with Aston Mar-tin's DB9 and the Bentley Continental GT - and as Bugatti, like Bentley, is owned by the VW Group, it could even use the latter's platform to cut costs. Engineers have already started work on the project. The final design is expec-ted to be signed off early next year, paving the way for a 2008 launch. However, development of the Veyron was plagued by problems, and bosses will be keen to avoid a repeat of that situation. When production does eventually get underway, the car will be built at the brand's Molsheim factory in Alsace, France. On show at the musee l'automobile de Mulhouse - Collection Schlumpf, the great mondial première, an exceptional exposition of the Bugatti Veyron and the Bugatti prototypes ; The six models on show will be the EB 110 and EB 112, the chiron, the EB 118 and EB 218 together for the first time! With, as usual, a Bugatti stand organised by the Prick brothers Jean and Benoit. 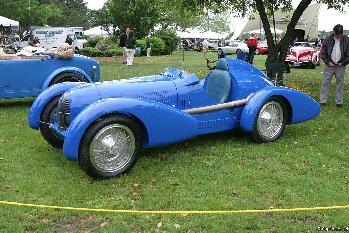 The famous show, probably (hopefully) with loads of Bugattis again this year! This picture was in the possession of Wilson Numan. He´s the guy who printed my Bugatti Legends book, when talking about cars, he told me that he had a Photograph of his aunt in a Bugatti. This turned out to be not a Bugatti, but a series of other pictures of mainly late 30´s Italian and German racing gear. Many of those have found their way to Joris Bergsma´s PreWarCar site, and were published there. This picture also reached me through Joris. Most of the pictures were taken by Wilson´s uncle, of his Aunt Mia, who also sits at the wheel of some of the cars in the other pictures. Not here though! 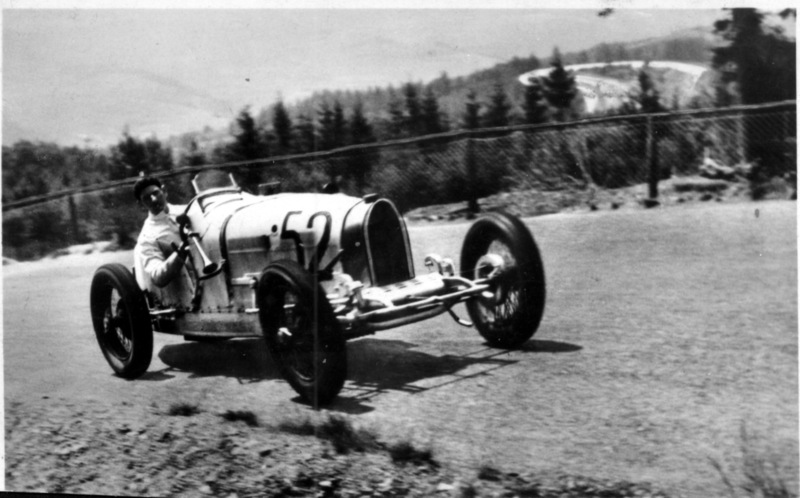 Can you inform who the driver is, what event (The other pictures were taken around 1935), and what is the chassisnumber of the car? 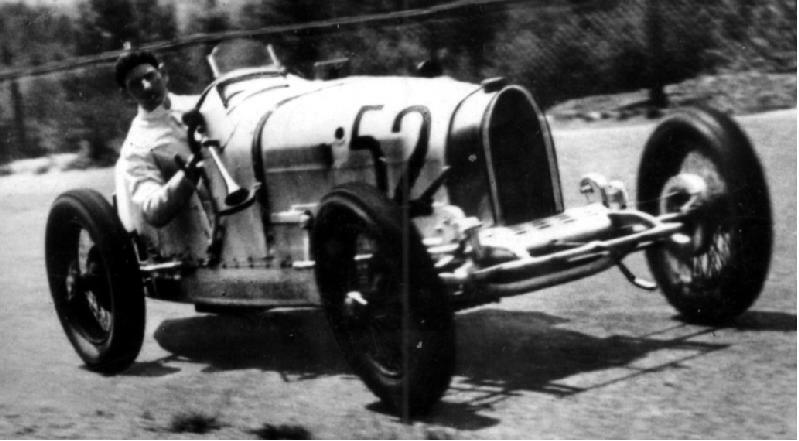 Due to pictures I compared with, this 37A belonged to Hans Simons, in this car winner at the Nürburgring 1928, 1500 ccm class. In your picture the owner is at the wheel.Together with Paul Pietsch and Hans Lewy, Hans Simons of Berlin formed the famous "Pilesi" Team. Despite Simons racing this very car until 1935, your photograph must be a very early one, perhaps around 1928, because I think nobody would have dared to race such tiny brakes in the mid of the Thirties.